SUMMARY: Seventeen-year old Sophie has been a servant in Duchess Ermengard's house for as long as she can remember. She's endured the duchess's unreasonable hatred and abuse for years. When a handsome stranger named Gabehart shows up and claims Sophie may be the daughter of the deceased Duke, Sophie is cautiously optimistic that this boy may be the key to her freedom. Soon, the duchess decides to have Sophie murdered, Sophie barely escapes with her life. Sophie flees with Gabe to the Cottage of the Seven, where she and Gabe grow ever closer, despite the fact that, if Sophie is indeed the missing girl, she was betrothed years ago to Gabe's older brother. 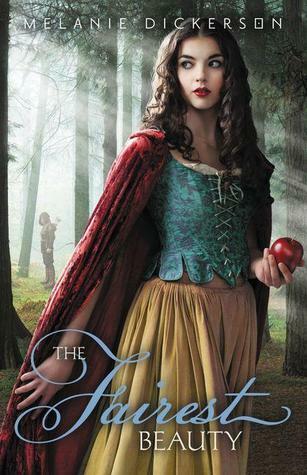 WHAT I LIKED: I just love fairy tales, and this Christian retelling of Snow White is endlessly sweet and fun. Sophie's story enchanted me from the first few pages, and I had a difficult time putting it down. While Sophie's character is strong in some things and weak in others, she makes a perfect Snow White. Duchess Ermengard is deliciously evil. And Gabe! He's a roguish Prince Charming who follows his own path, despite what his family tells him to do. For most of the story, there is plenty of action. Sophie and Gabe get choked, starved, imprisoned, shot at, and nearly eaten by wolves. The romance builds nice and slow, and I turned the pages voraciously, almost up to the very end. I love the twist Dickerson gives to The Seven. These guys are not the "dwarves" of Disney's Snow White; instead, they are men with disabilities, outcasts who choose to live life apart from society. Some of The Seven take on the characteristics of Disney's dwarves (for example, one is a narcaleptic who constantly falls asleep; another short, bow-legged man is a "Doc"tor; another is mentally challenged). The poisoned apple scene! Read it! WHAT I DIDN'T LIKE: The ending. It's a fairytale "happy" ending, but wrapping up the loose ends goes on a little long. Considering all the action and fun of the other 85% of the book, the last 50 pages were a let-down. One event in particular was overly convenient; it was timed just too perfectly to be realistic. Lots and lots and lots of praying and talking to God. There is nothing wrong with this (The Fairest Beauty is Christian Fiction), but for me, it was a bit much. Sophie prays for EVERYTHING that happens to her, and most of the time, her prayers are answered fairly quickly. As I read, I knew that if Sophie prayed for it, it was about to happen. I would have liked to see her take a more active role in what happens to her instead of sitting passively and constantly praying for something to happen to her. No magic mirror? So disappointing! THE BOTTOM LINE: Readers who don't mind lots of praying will find this Snow White retelling sweet and engrossing! STATUS IN MY LIBRARY: We don't have this yet (on order), but I can't wait to get it! I've already been talking this up in my library, and my students are excited to read it. It is sure to be a hit.